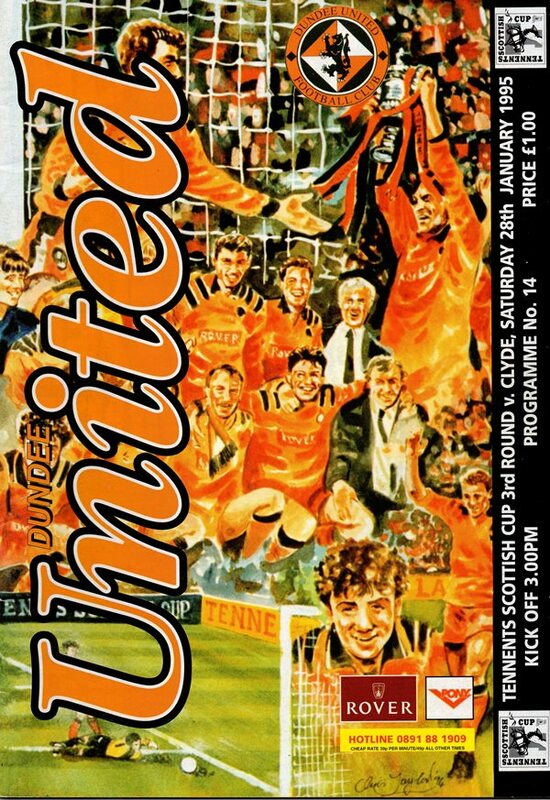 The first ever Scottish Cup meeting between the clubs somehow ended in stalemate, because United had enough chances to win not only this game, but retain the trophy itself! Evidence that this perhaps wasn't going to be the Tangerines day presented in the third minute when Craig Brewster hit the bar from the edge of the box. 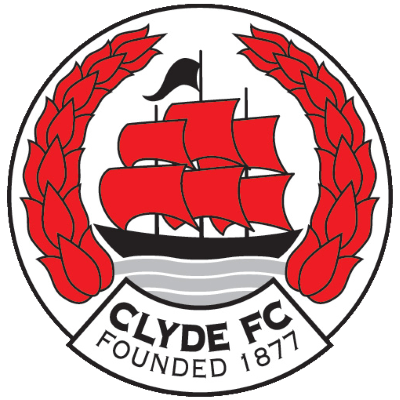 Clyde quickly countered that by also striking the bar five minutes later with Martin O'Neill hammering in a shot after a clearance from a corner fell to him just outside the penalty box. It was all action stuff and after a perky start by the second division side, United began to dominate, creating and missing chance after chance! The catalogue was almost endless. Most noteworthy in the first half was after 20 minutes when Billy McKinlay beautifully evaded the challenges of two defenders out on the left wing before driving the ball into the middle where Dailly whipped in a first time shot which Fridge acrobatically saved. But the first half pattern resumed almost as soon as the referee's whistle signalled the start of the second half. A venomously struck volley from Maurice Malpas whistled inches over less than a minute into the second period. Jerren Nixon carved the way open for Brewster, but Fridge was to alert as he lip the ball past the advancing keeper. United's cup final hero of last year passed up another golden opportunity after Fridge had done great to paw away a shot from Hannah but Craig Brewster knocked it wide. Frustration crept into United's play towards the end and with twelve minutes left the unthinkable almost happened as Gordon Parks broke clear and dragged his shot wide of the target. Golac commented, "We could have played for another week and not scored." 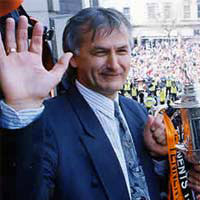 When I first arrived at Tannadice with the exception of Maurice Malpas, none of the players here had ever won a trophy, and that was one of my main reasons for trying to change the squad. But we went on to win the Scottish Cup and hopefully, that will only have whetted the appetite for the players to repeat that success again this season. Unfortunately, the Scottish Cup triumph of last season hasn't been the launch pad for better things in the league. However, I hope that last week's win -the biggest in the Premier League for over ten years -can be used as the platform to climb the table, because I am still convinced that we can finish second in the table and retain the Scottish Cup. That is certainly my aim and it would also prove my critics wrong! You have to be positive about these things, but whilst acknowledging that Motherwell are a hard team to beat, and doing it so convincingly, that victory meant nothing more than the three points and consequently, it will only be worth something if we can keep on winning. Last Saturday was undoubtedly our best ninety minutes since the Scottish Cup Final last May and I would say that those two games and the 3-0 win at Ibrox stand out as the three best performances since I came to the club. Our performance against Motherwell contained all the elements I like to see in my sides - hunger, determination and aggression. But if we are to achieve anything this season then we must carry on in the same vein for the rest of the season. If we can maintain a winning run over the next month then I might acknowledge that the game with Motherwell was the tuming point. Until then it is just one result on its own. Of course, last Saturday saw the debut of Sergio, our latest signing from Portuguese football. I don't think it took very long for everyone to realise what a good player he is. I am very pleased with his start, though unfortunately, he is unavailable this afternoon because he wasn't signed within 14 days of this afternoon's cup tie. But with Jerren Nixon also proving how effective he can be when he came on, we at last have some competition for places up front, especially with Paddy Connolly, Robbie Winters and Scott Crabbe also available. It means that the men in possession will have to produce the goods, because others are waiting in the wings, if they don't. Our defence of the Scottish Cup begins this afternoon against Clyde. For this match, I'll expect the players attitude to be spot on with concentration and 100% commitment. THERE IS NO CHANCE THAT WE WILL UNDER-ESTIMATE THE BROADWOOD SIDE BECAUSE I SEE THIS AS THE FIRST STEP ON THE PATH TO REPEATING THE JOYOUS SCENES WHICH OUR CUP VICTORY BROUGHT TO TAYSIDE LAST MAY.